Pools can be a lot of fun for the family, but it can also prove to be one of the most harmful areas on your property. Every year more than 300 children under the age of 5 die from drowning, while another 2,000 end up in the hospital injured. 1. Constant supervision. 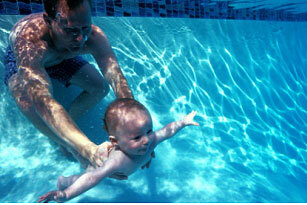 Teaching your baby to swim is a very exciting time, but it is important to supervise them at all times. Teach them early that the pool is off limits without a parent there to watch them. Older children should follow the same guidelines to eliminate any problems. 2. Fence your pool completely. The area should be surrounded by a pool fence or wall to prevent your little one from getting in. The barrier should be at least 4 feet high, and should be difficult to climb. Chain link is actually not recommended, because it is easy to climb. You can discuss your options with your local fencing company. The gate should be self closing and self latching and out of reach of small children. Baby Proofing Directory offers a comprehensive list of pool fence installers that you can search by zip code. 3. Install door alarms. There are a variety of inexpensive door alarms that you can install on the doors leading to the pool area. They work by sounding an audible alarm when the door is unexpectedly opened. They should have a keypad or other device that will allow adults and older children to pass through. Often times the alarm will startle the child and stop them from escaping. 4. Pool covers. There are a variety of pool safety covers on the market today. A good one must be able to support the weight of two adults and a child to allow for rescue. A good cover will allow for quick removal of any water on the surface (because baby can drown in an inch of water). The motorized versions are preferred because you can easily cover the pool with a push of a button. 5. Above ground pools. The ladders should be removed when the pool is not in use, or locked so that it can not be used. 6. Various floatation devices. In case of an emergency. Consult your pool supply company for options.